Iridescent’s The Fluid Ether is live! This is a guest post by Kevin Miklasz, Director of Digital Curriculum at Iridescent. This week, we finally released the second version of our physics simulation app! The Fluid Ether is a physics simulation game. You can find it in the App Store, or as a desktop download from our website. If you want to know more, read about the plans for the entire Ethers series or sign up to our newsletter to stay updated about progress in the series. In The Fluid Ether, students gain an intuitive understanding for fluid dynamics through the experience of playing the game. Players turn jets on and off to create patterns of play that accomplish simple level objectives like breaking blocks and collecting coins. Getting better at the game means knowing how best to manipulate jets of water- so learning the strategy to beat the game means learning physics. The game includes 3 features that distinguish it from other games out there. Deeper learning through challenge levels: Open-ended levels are punctuated with directed gameplay (called challenge levels), which causes kids to reflect on their learning and test understanding. Challenge levels will present one objective in a highly constrained format, directing the kid’s attention to features they may have taken for granted, and testing their understanding of those features. For example, in the “density” challenge level, kids learn that balls of greater density have more inertia and take longer to accelerate. 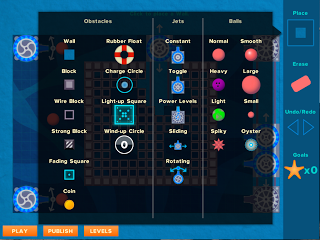 Level Editors: Kids are encouraged to customize the game and add new levels through the level editor. They can choose from any of the objects or goals included in the game, allowing for kids to be real creators of media within the context of the game. 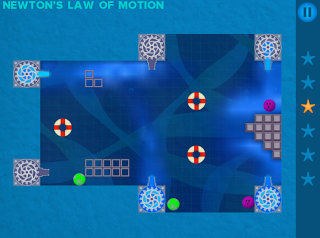 Creating their own functioning levels allows kids to both practice their design skills, and to engage more deeply with the physics in the game. Data collection system and teacher interface: The game collects data as kids play. We offer a free online dashboard for teachers to see their kid’s play data as they play. The play data will also be used by Iridescent as in-game assessment of learning (meaning, we will try to say that students understand physics through their click and gameplay). In the future, we will work with the Institute of Play to develop resources for teachers and educators to use the game in their programs, as well as hold Ethers Professional Development sessions. The app was the result of a year of refining and redeveloping the original app, called “World of Physics: Fluids,” for those of you Iridescent regulars. Based on all that we learned developing previous apps, we put our best practices to good use in developing this app. Personally, this is the first app that I have developed with Iridescent, and I was very excited to be able to put my educational game design philosophy into a digital game. I’m excited to continue developing the games in this series! We have six games planned, on Fluids, Gravity, Light, Momentum, Projectiles and Electricity. In fact, we’ve already begun work on The Gravity Ether, thanks to a Spark grant from Hive Digital Media Learning Fund in the New York Community Trust! Our learning from the first game will allow us to go through The Gravity Ether in a quarter of the time: we’re planning to release the game this September, so stay tuned! The initial artwork for the other five games in the series. Thanks to our development partner, Robot Super Brain, and our graphic designer Ioana. The Office of Naval Research funded this game. Have you RSVP’d to the party yet?